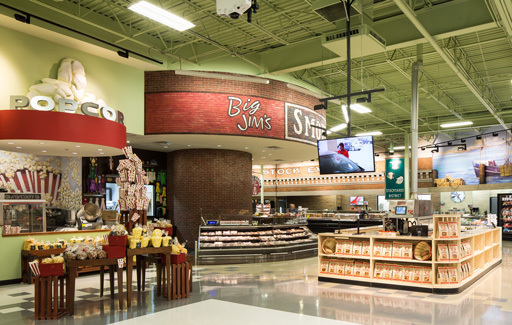 To transform this existing Price Chopper into a flagship location, a number of new features and concepts were integrated into the store’s remodel and expansion. The 20,000 sq. ft. addition allowed some of the store’s current departments to expand, and also introduced new specialty areas. New features include a café area with restaurant-style seating, and a fireplace, sushi bar and interactive floor displays. In addition to updating the original building to meet current Overland Park design standards, one of the main challenges our team faced was phasing, in order to keep the store operational during the remodel and expansion. Detailed construction phasing plans were developed to guide the contractors and follow the project schedule with minimal disruption to the store’s business flow.